What makes us “advanced” in pediatrics? We treat children with common issues such as allergies, ear tubes, hearing tests and adenoid removal all the way to more complex cases which include cochlear implants and head/neck cancer. We treat all children like they are superheroes regardless of how big their issue is. Not only are the doctors and staff pediatric friendly, but so is the equipment that is used. We are one of the only ENT practices in the region that can offer a low dose radiation sinus scanner (1/10 of the radiation compared to hospital CTs) that provides immediate access to images at the child’s point-of-care, resulting in a faster diagnosis and treatment. The scan is painless and usually only takes up to 90 seconds. Children and teenagers must not be confused with adults for the diagnosis and treatment of ear, nose and throat related conditions. While there are fundamental similarities with an adult, a young person's stature, weight, immune system, physical and mental development require special care and consideration. Proper dosage and selection of medications; observation of acute and chronic (reoccurring) ailments, and watching for the non-verbal signals a child presents are paramount in the treatment of your child. 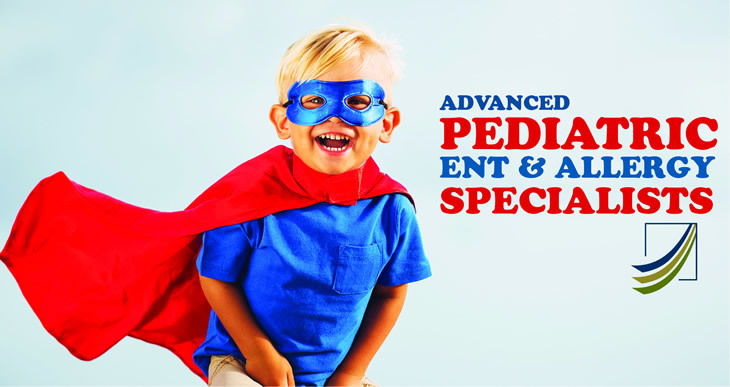 At Advanced ENT and Allergy we have the trained staff, facilities and the equipment required to treat all areas of pediatric otolaryngology. We will work closely with the family, the pediatrician, and must importantly, our younger patients to get your child healthy and well. Allergic symptoms may manifest as difficulty breathing, respiratory distress, hay fever, sinusitis, rhinitis, otitis media (ear infection) and dizziness. Our physicians can help control or resolve allergic symptoms with 1) lifestyle modifications, such as avoiding pollen, dust, mold and allergenic foods; 2) medication; 3) immunotherapy (allergy shots) and/or sublingual immunotherapy (allergy drops taken conveniently at your home). Allergic disorders rank first among children’s chronic diseases. Any child may become allergic, but children from families with a history of allergy are more likely to develop allergies. Prick Test - This technique involves the use of a small applicator called a "duo tip". It is much like a small plastic toothpick. The duo tip contains a small amount of an allergen extract that will be applied to your back. Examples of the extracts include ragweed, dust mites, grass, molds, or even foods. After one of the Allergy Care physicians determines which substances to test for, one of our nurses will draw a grid on your back with an orange colored highlighter. She will then take a number of the tips and prick the skin at each one of the designated grid sites. This technique will feel like a small scratch. The surface of the skin must be scratched in order for the antigen to penetrate your skin. With this type of testing, redness and swelling will only occur in the spots where the tiny amount of allergen to which you are allergic has been introduced. For example, if you are allergic to dust mites, but not ragweed, the spot where the dust mite allergen touched your skin will swell and itch. The other site will remain normal. In order to assure our physicians that you are being tested properly, the very first and very last tips will contain histamine. This substance usually reacts on every person, no matter what your other allergies may be. The test results are usually available within 15 - 20 minutes. One of our physicians will then come read the results and determine your allergies based on your reactions. Intradermal Skin Testing - This technique involves injecting a small amount of allergen extract under the skin with a small needle. Once the physician determines what you need to be tested for, one of our nurses will come back to your exam room and begin the injection process. The nurse will use a small syringe to inject the antigen(s) right below the surface of your skin. It will feel similar to having a tuberculosis skin test performed on your arm. What appears to be a small bubble will appear at the injection site. While you are waiting 15 minutes for results, you must not scratch, push on, or irritate the injection site(s). If you have a positive intradermal reaction, a red, itchy whelp will raise to approximately the size of a dime. It is not unusual for this reaction to persist for several hours and it may not fade for several days. It is also possible for there to be slight bruising around the injection site. Both of these types of reactions can be alleviated with the use of over-the-counter hydrocortisone cream and/or the use of a cool pack after testing. Unless there is severe pain or the reaction triples in size over a 24 to 48 hour time period, you should not be concerned about your reactions. Rarely, there may be a residual bruised appearance for up to several weeks after a positive reaction. Allergen Patch Testing - This technique tests for allergies to 24 different types of metals and fragrances. It involves placing a 4" x 6" plastic sheet on your back. On the side that is touching your skin will be a four-column grid that contains the allergens for testing. The patch test will stay taped on the back for 48 hours. During this time, you may feel slight local reactions of itching and redness. Again, do not remove or irritate the test site. After this time, you will return to our office for the physician or his assistant to read the results. Blood or RAST test - This involves having your blood drawn. We do not do this test in our office, but we will give you an order to go a hospital lab or your primary care doctor's office to perform this. The results of this test will take several days or weeks. RAST tests are generally used in cases where skin tests cannot be performed or were negative, and your doctor is still suspicious of your symptoms. Our pediatric ENT physicians treat diseases of the ear, including hearing loss as well as trauma, infection, tumor and nerve pathway disorders. If your child is experiencing hearing loss, ear aches, dizziness, ear ringing or unexplained lumps or bumps, a quick examination can help determine the cause. If you would like to schedule an appointment with one of our pediatric specialist, please call (502) 995-5525 or click the button below.